Fava Bean Soup is another classic dish in Mexico for Lent time. My siblings and I weren’t too fond of this soup when we were growing up, so my Mom would add slices of hot dog sausages so we would eat it! Nowadays when we eat it at home, all those childhood memories come rushing back to me and put a smile on my face, because this time I actually enjoy having this soup for lunch or dinner. Lent time is a Christian religious observance that starts on Ash Wednesday and ends just before Easter, a period of about six weeks. During Lent, some people avoid consuming certain types of foods in order to purify their spirits (people used to fast during Lent, but the traditions have changed with time). Usually, people abstain from eating the meat of land animals and only eat fish and other types of seafood. Consequently, fish, seafood, legumes, and vegetables take center stage at the dinner table during Lent each year. Every region of Mexico is rich in resources and has a vast variety of fruits, vegetables, and herbs. This wealth of ingredients allows for a large number of variations to this recipe, as every cook seasons this soup according to their taste and the supplies available to them. Some cooks make this soup with Serrano peppers, others add dried peppers, and still, others use mint instead of cilantro. 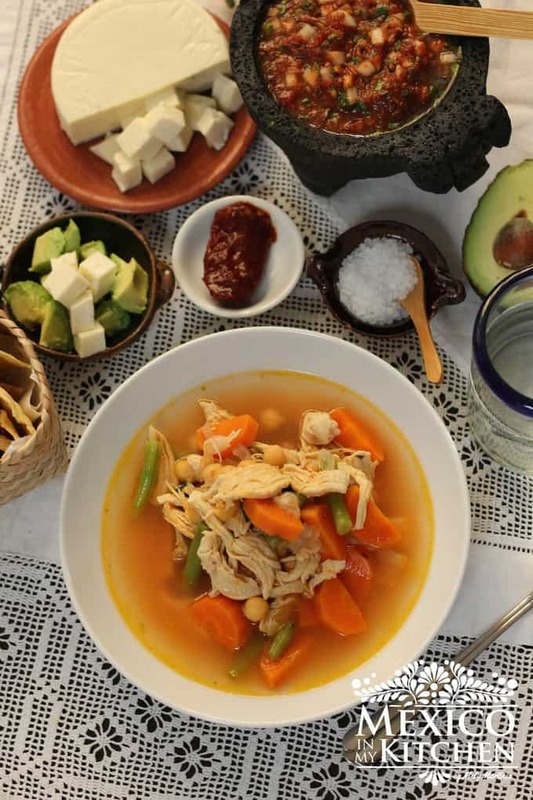 Whatever way you may prepare it, I hope you enjoy this soup, since it is a delicious part of our Mexican traditions. While you cook the beans, prepare the “recado”: heat one tablespoon of oil in a medium-size skillet for 2 minutes over medium heat. Add the chopped garlic and onion and keep cooking until the onion is transparent. Mix in the chopped tomato and stir, cooking for another 5 minutes or until the tomato mixture starts to thicken. Stir the tomato mixture frequently to avoid it from sticking to the skillet. Add the tomato mixture to the fava beans before they finish cooking to let all the flavors combine. Stir in the drained nopales, season with salt and pepper, and keep cooking until the beans are tender or at the desired consistency. You can use a bean masher to mash some of the beans and give the soup a creamy consistency. Mashed fava beans will thicken the soup. Ladle the soup into bowls and sprinkle with chopped cilantro. I love to serve this soup with slices of French bread to dip into the soup. Fava Bean Soup is another classic dish in Mexico for Lent time. My siblings and I weren’t too fond of this soup when we were growing up, so my Mom would add slices of hot dog sausages so we would eat it! Nowadays when we eat it at home. 1 cup nopales cooked and drained. cups of cold water and cook over medium-high heat. Once it starts boiling, reduces heat to a simmer, and partially cover with the lid. They will take somewhere around 40 minutes to be tender. *To soak the Fava beans overnight, place them in a bowl and cover with water. The next day, simply drain the water. **Optional. Blanch the tomatoes by placing them in boiling water for about 15 seconds, and removing them with a slotted spoon. Place under cold water or in a bowl with ice water. The skins will peel off easily with the help of a paring knife; see picture below. ***Instead of salt, some cooks add granulated chicken bouillon to season the soup. Fava Bean Soup is not only delicious, but it also has a high content of fiber, protein, Vitamin A & C, and Iron. PS. Don’t forget to subscribe! Have you tried Fava Beans? That is one soothing looking soup, Mely. There is quite a chill in the air today. I sure wouldn't mind warming up with that soup! I'll be pinning it on Pinterest! I hope you enjoy it as much as my husband and I do.